Creating a clean energy economy that reduces the risks of climate change is economically and technologically feasible, but a transition on this scale comes with challenges. This chapter examines the barriers that must be overcome to create a clean energy economy in the U.S. But the clean energy transition cannot be accomplished simply by adding solar panels, wind farms, and other low-carbon resources on the margins of the existing electricity system. Instead, the most promising pathways require doubling the total amount of electricity generated while also shifting primarily to low- and zero-carbon sources. This transition also means switching to low- and zero-emission cars and trucks while making buildings and industry more efficient. These challenges are difficult and daunting, but they can be overcome with the right policy framework combined with a strong commitment from U.S. businesses to effect this transition in their own companies and industries. The bottom line is that this transition is not optional: It is something that must be done to combat the major economic threat of climate change to our businesses and overall American competitiveness. All four potential pathways to a clean energy economy require building many new clean power plants, across every region of the U.S. (Figure 10)1. This will provide opportunities for jobs and local economic stimulus, and the level of overall investment appears feasible. However, the power sector would likely face real challenges in the siting, permitting, and construction of this new infrastructure. 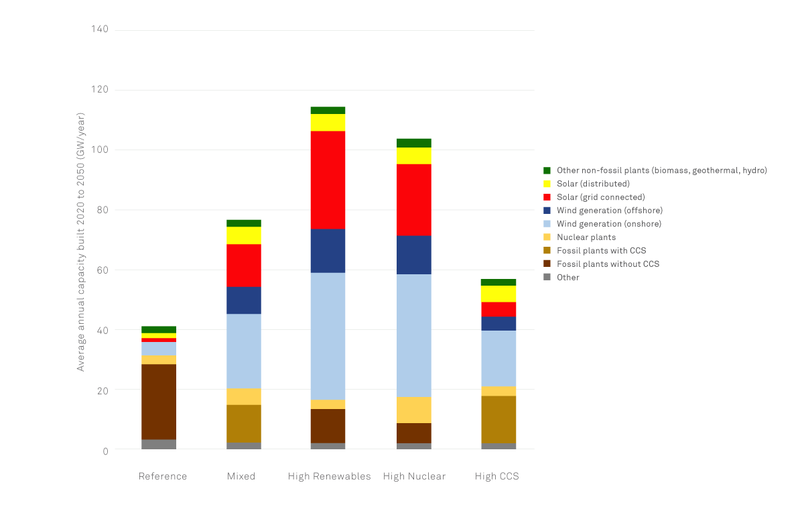 Figure 10 shows average annual capacity additions of different types of generation for 2020-2050 for the four clean energy pathways and the High-Carbon Reference Case. Our modeling shows that building a clean energy economy would require constructing power plants at a rate nearly two times the rate in the High-Carbon Reference Case (for the Mixed Resources pathway) and nearly three times that rate in the case of the High Renewables pathway. For some renewable technologies, this would require plant construction at a rate two to five times higher than average historical rates. (For details by technology, see Appendix.) The Mixed Resources pathway would require the nuclear industry to build new plants at a rate roughly 17 percent higher than the historical rate from 1970-1990. The High Nuclear pathway would require a build rate roughly 80 percent higher than the 1970-1990 rate. Achieving these rates would require a much more accelerated siting, permitting, and construction process than that in use today. One of the major technical issues with dramatically scaling up renewable energy is the variable nature of these energy resources. The power generated by wind turbines drops when the wind dies. Solar PV output dips during cloudy days and is zero at night. This variability is one of the defining features of renewable power, and requires careful minute-by-minute balancing between load centers and electricity generating units. Yet fossil-fired electricity generating units may have somewhat variable output as well—for example, through forced outages, scheduled maintenance, or transmission constraints on generation—making the integration of variable electricity generation resources not a fundamentally new problem for the utility industry. However, accommodating high levels of renewable power in a clean energy economy would create new operational challenges2 A grid powered with a high percentage of variable renewable energy would have to be highly flexible, and be able to handle variable power outputs on shorter time scales and with less predictability than grids powered largely by fossil fuel and nuclear plants. Extensive studies of these challenges, and observation of specific states and countries that have moved forward with grid integration plans, make clear that high levels of renewable power can be cost-effectively integrated into the grid without threatening reliability3. In our PATHWAYS modeling, much of the load balancing is achieved through production of hydrogen and synthetic natural gas4. These facilities would be oversized in production capacity in order to allow them to operate flexibly and absorb excess power generation. However, we expect that to integrate higher levels of renewable generation, grid operators would likely use an array of tools for maintaining the match between supply and demand. In fact, they are already adept at predicting and managing big, rapid changes in load. Tools include dispatchable resources, diverse types of resources, geographic diversity in generation, and the use of energy storage and demand response resources. All of these tools would likely grow in importance as renewable power expands. A diverse portfolio of wind and solar plants allows for more consistent power supply, as some of the plants can still operate when winds slow or clouds cut solar output in specific locations. Denmark has successfully integrated 39 percent of its total electricity generation from wind power, but its interconnection with Germany has proved critical for balancing periods of surplus or insufficient Danish wind generation5. Renewable sources are best integrated when the grid covers a larger and more diverse geographic footprint6. Building more transmission lines can therefore be important to integrating renewable power on the grid7. Integrating renewable power on the grid also requires large-scale energy storage8. Parts of California already generate more solar power than can be used during the afternoon on some days9. As a result, California has mandated that utilities add 1.325 GW of storage to the grid by 2020 to capture the excess solar power and to increase flexibility10. Meanwhile, advances in batteries and other storage technologies have caused prices to decline significantly, making them cost-effective for some applications11. Large battery installations in places like Moraine, Ohio, and Elkins, West Virginia, are already being used to manage power quality and short-term fluctuations on regional grids12. More flexibility can also come from applying information technology to grid operation, creating a “smart grid” which can give customers more ability to match energy use to times when the grid is not already overloaded13. Such technologies will also facilitate the adoption of electric vehicles, allowing the grid to charge these vehicles at times when renewable power is available. Electric vehicles can ultimately serve as a form of energy storage for renewable power, as can space and water heating systems. Ultimately, it should be possible to draw power from connected electric vehicles when needed14, though this technology is still in its infancy. In each of our four pathways, a clean energy economy requires significant new investment in transmission and distribution (T&D)15. However, different pathways require different T&D approaches. For example, a future that relies more on large utility-scale renewable generation requires more long-distance high-voltage transmission lines than does a distributed generation system. The expansion of the transmission system faces similar obstacles as does building new power plants. Proposed projects typically face local opposition, permitting issues, and regulatory questions around rate recovery and siting authority. Wind and solar projects have been slowed because the transmission lines needed to get their power to markets have yet to be built. Meanwhile, utilities have been reluctant to invest in the local distribution systems that enable more roof-top solar panels and other distributed generation to send power back to the grid, since under the current utility business model, these distributed systems cut utility electricity sales and revenues. A clean energy economy would require major transformation in the transportation sector. Our four clean energy pathways include a major shift from oil to combinations of electricity, hydrogen, synthetic gas, and biofuels to power the nation’s cars and trucks, along with continuing improvements in design and materials that reduce vehicle weight17. This transformation would cut the overall energy used in transportation in half by 2050 compared to the High-Carbon Reference Case. One of the challenges to achieving this transformation is overcoming auto manufacturers’ basic chicken-and-egg problem: manufacturers will not produce new vehicle types without sufficient expectations of demand, and customers can’t buy cars that manufacturers don’t offer. Retooling takes time and money, and most of these companies operate on debt without the cash on hand for major capital investments in their facilities. New materials are also expensive when first deployed, thus impeding the widespread adoption that would drive down costs. Electric charging stations and hydrogen fueling depots are also far less numerous than conventional gas stations, but their numbers won’t increase substantially until many more EVs or hydrogen-powered cars are sold. And finally, there is the economic reality that many consumers hold onto their vehicles longer than the recommended lifespans of these capital investments, meaning that turnover rates can be slower than anticipated in our modeling. What may speed the transition are the advantages that electric cars offer to consumers. In addition to lower fuel costs, even at 2016’s low oil and gasoline prices, electric cars offer better performance, greater reliability, and lower maintenance costs, since they don’t require oil, coolant, transmission fluid, or many other complex systems found in conventional internal combustion engine vehicles18. In some cases, maintenance is as simple as downloading a software patch. Those advantages, along with supportive policies such as state and federal tax credits and rising fuel economy standards, explain why manufacturers are making significant investments in electric vehicles. Bloomberg New Energy Finance forecast that global sales of electric vehicles will hit 41 million by 2040, which would represent 35 percent of new light duty vehicle sales19. Manufacturers along with some utilities are working to increase deployment of electric charging stations; however, these require additional upfront capital expenditures. Our modeling of clean energy pathways assumes the same continued modest growth in vehicle-miles-traveled per capita as in the High-Carbon Reference Case. However, demographic trends and supportive policies could reduce that growth and make emission targets easier to achieve. Meanwhile, better information and communication technology can improve traffic flow. For example, drivers are already alerted to traffic jams—and offered alternative routes—by GPS mapping and cell phone apps. Creating a clean energy economy does not require an energy miracle. It can be accomplished by deploying existing (and near-commercial) technologies, while incorporating improvements and innovations as they become available. But the timing of new investments is critical in every clean energy economy pathway. As we noted earlier, investments in clean energy technologies make the most sense when businesses replace obsolete technologies at the end of their lives, rather than prematurely retiring assets while they remain cost-effective to operate. Investments over the coming decade are critical, as they will lock the nation into an energy system made up of long-lived infrastructure that will continue to operate for decades to come. Ideally, businesses should make the right choices each time an asset is fully amortized and can be economically replaced. One challenge to smart capital stock replacement, though, is that businesses often evaluate energy efficiency and renewable energy projects using high hurdle rates (20 percent or more) rather than the lower expected returns that may be acceptable in other areas of corporate investment. Such practices limit many cost-effective investments in energy efficiency and clean energy technologies. A project may offer a reasonable payback within five to 10 years, but that may not be competitive against a high hurdle rate. So there is a risk that many of the investments that our analysis shows are cost-effective will not be made despite their clear benefits from a climate risk-reduction perspective. Ensuring access to low-cost capital for such projects and overcoming both internal and external impediments to those investments is therefore critical in the coming decade. The transition to a clean energy economy requires not just the right timing of investments, but also coordinating these investments across several sectors that have historically not been closely coupled: energy, transport, buildings, and manufacturing. Powering millions of electric cars, for example, requires building new power plants at a rate that matches the growth in vehicle numbers (in addition to the expansion of clean energy generating sources to decarbonize electricity generation). The electricity and transportation systems also need to be better integrated to manage the complexity of more low-carbon sources (which ultimately can include plugged-in vehicles that send power to the grid when needed). If investments in each area are not complementary, there is a real risk of both companies and the country going down a “dead end” pathway that reduces emissions for 10-20 years but constrains the options for reductions over 30-40 years. That’s why both the public sector and the private sector must play a role—through a realignment of both investment strategies and government policies—ultimately ensuring that businesses have the right information and incentives to invest in the combination of technologies that make the most economic and technological sense. One paradox of the transition to a clean energy economy is that, if this transition is successful, it may lead to lower fossil fuel prices and resulting higher demand for fossil fuels—thus slowing momentum. In the absence of supportive policies for clean energy investment and deployment, lower fossil fuel prices will make it harder for solar, wind, and other clean energy to compete. For example, low gasoline prices in 2015 and 2016 (caused in part by lower demand due to gains in vehicle fuel efficiency) have contributed to increases in sales of less fuel efficient vehicles, causing gasoline demand to grow again. Recognizing this dynamic, we explored a scenario in which a global clean energy transition leads to a significant drop in global fossil fuel prices20. PATHWAYS projects that this would save the U.S. economy at least $100 billion per year in lower fossil fuel costs beginning in the early 2020s (in the Mixed Resources pathway). However, it would also diminish the fuel savings from each additional deployment of clean energy technologies. This highlights the need for policies that support the long-term transition to a clean energy economy. A carbon price could be particularly effective in this context. The price could be set to make up for some or all of the drop in fossil fuel prices (or be set even higher). That would ensure that after-tax prices remain high even as market forces drive the pre-tax prices down. PATHWAYS projects some decreases in the costs of clean energy technologies in the coming decades, but probably understates the likely cost reductions. However, such decreases alone may not be enough to counter the effect of falling fossil fuel prices. Similarly, rapid growth in renewable generation would reduce the marginal value of adding more new installations. In typical wholesale power markets, when more solar or wind power is added to the grid (with a marginal cost to the generator of zero or near-zero), the market-clearing, short-term price of power decreases. This downward pressure on the wholesale power price (as the supply of renewable generation increases) can reduce the rate of return on existing plants and reduce investors’ expected returns on new plants. This effect could slow the momentum for new power plant construction in those states that have restructured their utilities and rely on wholesale markets for generation, and points to the need for improved market design by regulators21. These perils of success increase the importance of a strong and consistent policy framework to support and maintain momentum for the clean energy transition.